Large Residential Finalist in the 2018 UK Passivhaus Awards. Set within an extensive landscaping scheme in the grounds of the existing Lichfield Grade I listed Almshouses. The Almhouses provides sheltered accommodation, or more specifically, ‘independent living for older people, with neighbourly support and care’. 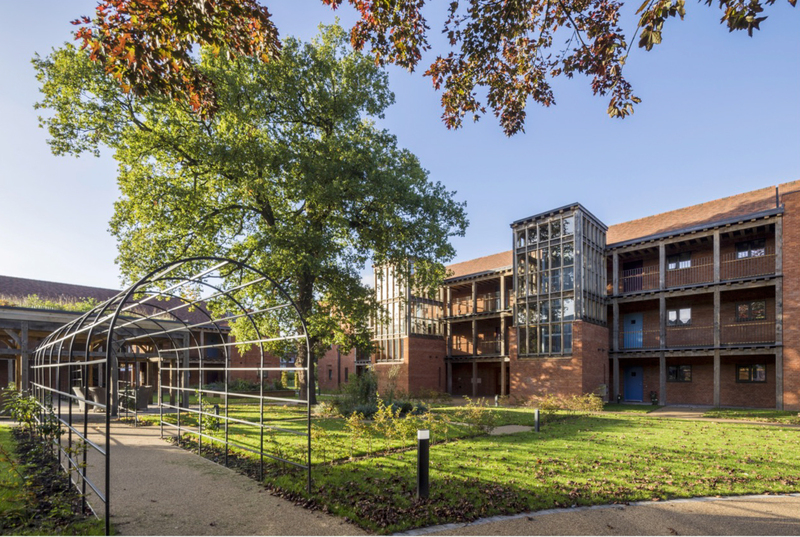 This social aspect is key to the design of the 18 new apartments; arranged around a communal courtyard with an oak framed pavilion at its heart, the scheme seeks to reinforce the sense of community established over centuries at St. John’s. Two separate buildings are arranged in an L-shape around a new formal courtyard and oak framed pavilion. Initially, a traditional brick cavity construction was chosen to increase the number of contractors willing to tender by reducing the number of unknown elements of the build. Contractors tend to cost Passivhaus projects as high risk where they have no experience of this, so some familiarity with the construction methods was seen as essential. Traditional construction was used, including masonry cavity walls, timber trussed roofs and concrete slabs throughout. Natural external materials include handmade bricks, clay plain roof tiles, copper cladding and green oak framing. The scheme has a centralised gas boiler that provides domestic hot water and heating. The larger block has a centralised MVHR plant. Individual MVHR units are utilised in the smaller block. There was an important social / community aspect given the nature of the sheltered housing with neighbourly support and care; this was emphasised in the concept and informed the overall design as well as providing greater significance to the 'low running costs' benefit of passivhaus. The client is delighted with the apartments and the internal environment has been reported as being very comfortable, even during the recent hot weather. The form of construction contract changed part way through the build, from traditional to management contracting, when the original main contractor went into administration. This meant a shift in the apportionment of financial risk onto the client and lead to significantly higher build cost. On site, undertake more dedicated passivhaus workshops as the construction progresses to ensure all critical details arediscussed, analysed, revised if necessary due to build-ability, and fully understood by those supervising and carrying out the work.